At Ängsbacka, Sweden, Thursday 5th September to Sunday 8th September 2019. For women who feel whole, empowered and are looking to dive deeper into the the integrity of their full truth. We are ready to embody a womanhood that merges ancient wisdom with our current day reality, one that honours the duality of life; darkness and light dancing, chaos and order, feminine and masculine. A radiant womanhood that can heal, awaken and unite to bring forth a better future for ourselves and the world. The Feminine speaks a different language than just words. It’s emotion. Intuition. That which is in your body and not just in your head. The web that binds things together. The link between generations. The feeling when you inhale the smell of the forest or walk barefoot in the grass. A silent whisper, a thunderstorm. Giving birth. The seemingly chaotic, spontaneous, yet so vastly advanced and intelligent creativity in nature from which life itself grows. That which is so powerful that it sometimes frightens us. While both the Feminine and the Masculine is present in all humans, no matter their gender, the feminine generally manifests itself more clearly in women, as the masculine does in men. 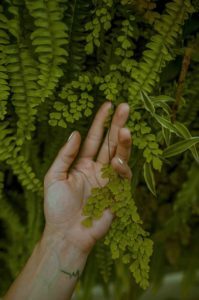 The feminine and the masculine are polarities, not in opposition, but rather like magnetic poles, day and night, chaos and order, sensing and direction, yin and yang – they need each other for their very existence. With the duality of masculine and feminine integrated and combined harmoniously, life can exist. With one of them being unbalanced, we see stagnation, harmful growth or oppression. For centuries, women have fought for their equal right to freedom. We truly honour the paths our mothers, grandmothers and great-grandmothers have walked in order for us to be free. While we cherish what has been achieved, it still remains true that Western society was mainly created on masculine values and that most women are adapting to systems and lifestyles that were not designed for us. We want to celebrate our ability to create, give and nourish life and acknowledge the power and importance of motherhood. We want to deepen and lead from our pleasure, sensuality and lust – acknowledging them as our life force. We want to cherish our wisdom to step confidently into the unknown, trusting our intuition to illuminate the most veiled of possibilities. We want to honour and acknowledge the matriarchal qualities of feminine leadership in all areas of life and bring out our feminine power as radiant, vibrant, spiritual, crazy, playful, loving, passionate, vulnerable, strong and free. On this journey, we believe that women are each others’ greatest source of inspiration. We believe that being part of a strong sisterhood, where we can inspire, learn, challenge, create and love each other with all our strengths and weaknesses, is fundamental. To fully see the Feminine within ourselves, we need to see it in each other. We wish to acknowledge and bring out the life force in all women as we are greater together. We believe we are at a threshold. The way forward is not regressing to traditional values where women only belonged in the household nor is it to continue adapting to masculine values. What we want is an awakening of feminine leadership, creating a new vision for what it means to be a woman today. As we step into our full radiant power, we encourage our brothers, fathers, sons, friends and lovers to do the same. Through sisterhood we will support each other to reach our highest potential, supporting men to reach theirs, so that we can lift each other up in compassion, love and understanding in order to build the world we want to see. Rather than seeing ourselves as oppressed in the patriarchy, we are stepping into the Matriarchy that will, in union with the Patriarchy, form a Humanarchy, laying the foundations for a future we can believe in. We warmly welcome you to join us on this adventure and discovery of Womanhood at Ängsbacka in September 2019. To cover all expenses the tickets starts at an early bird price of 4800 SEK, regular price 6000 SEK, and then differs depending on what accommodation you prefer. We offer a course price of 2800 SEK plus accommodation and food for the first 20 women under 30 years or over 65 years signing up. There are also 20 tickets for the event sold at a reduced fee of 690 SEK to people under 21 that accompany an above 21 participant. If you would like to contribute to the organisation of the gathering and/or are on a limited budget, please let us know as concessions are available for a limited amount of volunteers. “Ängsbacka is a sacred focal point bringing people to the realization of whom and what we really are beyond all thoughts and concepts. Ängsbacka is located in Molkom 30 km north of Karlstad and is easy to reach by bus or car. To Karlstad you can also arrive by air or train. It is about 3-4 hours from Oslo, Stockholm and Gothenburg. 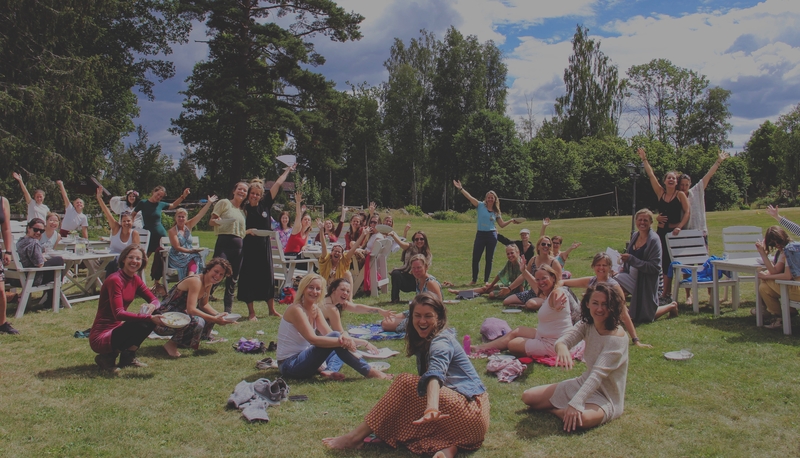 Questions about the Nordic Women’s Gathering?